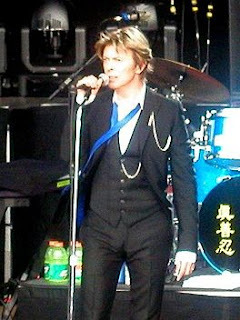 On Astropost I write about the Mars-Saturn issue in the chart, transits and progressions of David Bowie. Mars-Saturn is the theme of discipline, ended energy and blocked activity, but also the theme of heroes. There are rumors about his health AND there are rumors about a concert during the Olympics. The Mars-Saturn energy requires hard work and strict measures. Let us see how this energy pops up in real life. Here I have a look at the artist in the chart. David Bowie is a man of many talents. Maybe that is why there are so many prominent placements in the chart. (Jupiter and Uranus symbolize the sudden windfall. It is a lucky combination). This shows us that there is passion (Venus and Mars) and that there are party's (Venus and Jupiter) and maybe a short fuse (Mars-Uranus) but also always successful action (Mars-Jupiter). Those are 70% of the placements. Among them: Moon, Neptune and Venus, part of the pattern of artistic talents. The Moon is trine Venus and half sesquisquare (67.5d) Neptune. Venus is septile Neptune. Venus is conjunct Midheaven, the Moon is trine Midheaven and Neptune is sextile Midheaven. All three are prominent in the chart. It is unmistakable the chart of someone with a great professional artistic career.